Dementia can cause personality changes. The Cornell Depression Scale is used to evaluate the mental state of older adults who have a cognitive impairment. In situations where the cognitive impairment is mild or moderate, it can be used quite effectively as a tool to diagnose depression. When the impairment is more severe, the individual's family members or those caring for him or her can answer questions about the person's condition. Depression may be difficult to diagnose properly in elderly people for a number of reasons. Many older people feel that being depressed is a normal part of growing older and that they need to just learn to live with feeling hopeless or empty inside. They may not go to their doctor to report that they are experiencing these kinds of symptoms due to concerns they are either mentally unstable or weak. Some medications can cause symptoms of depression, and unless people have been alerted to this fact, they may not see a connection between what they are taking and how they feel. Losing a spouse or moving from the family home into an apartment or a nursing home can trigger feelings of depression as well. Chronic pain and depression are also closely linked. Many people who are depressed are never diagnosed. In the case of a person with dementia, diagnosing depression is even more challenging. People with dementia have an impairment in their brain that makes it very difficult for them to remember things, to learn new concepts or skills or even to communicate effectively. They may forget how they got to a specific location or how to get back home after going out. It is normal for someone to have changes in their mood, but rapid mood swings may be a sign of dementia. A person with dementia may have a normal mood, and then switch to tears or anger in a short period of time. 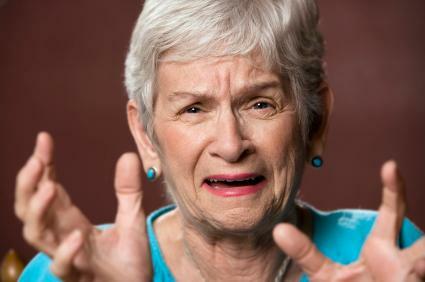 A previously easygoing person who has dementia may become irritable or anxious. Dementia can cause people to lose their love of life. They may isolate themselves and not want to go out often. The Cornell Scale for Depression in Dementia is used in situations where a person needs to be screened for depression and is also suffering from dementia. It is designed to evaluate a range of symptoms associated with depression through the use of an extensive interview. The person's caregiver is given the opportunity to provide information, and the patient is also observed and interviewed in order to make a determination about whether he or she is depressed. Once a diagnosis of depression in an elderly person has been made, treatment can begin. There are a number of antidepressant medications that can be used to treat this condition, although antidepressants are far from being a "magic pill" that will immediately help them feel better. It can take several weeks before the person notices the feelings of depression lifting, although some people report feeling a difference almost immediately. Before the doctor can make a good choice about which antidepressant to prescribe, he or she will need to know all the medications the person is taking, since drug interactions are possible. If the person is receptive to it, psychotherapy can be used, either on its own, or in conjunction with medications, to help the person understand their condition and learn different ways of thinking about themselves and the world around them. No one has to live with depression, especially older people. The Cornell Depression Scale is a tool that healthcare professionals can use to make the right diagnosis so that the person experiencing the symptoms of depression can get the help they need.